Mitt Romney today proposed raising the Medicare eligibility age in 2022. He also proposed restrictions on future social security benefits. Romney said his proposals for Medicare and Social Security would begin in 2022, meaning no current or near-retirees would be affected. He also said he favors adjustments to curtail the growth of future benefits for the relatively well-to-do, so "lower-income seniors would receive the most generous benefits. 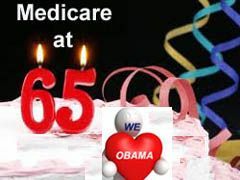 Beginning in 2022, Romney said, "we will gradually increase the Medicare eligibility age by one month each year. In the long run, the eligibility ages for both programs will be indexed to longevity so that they increase only as fast as life expectancy." President Obama took a stand for Democrats and seniors today. I'm canceling his pink slip notice. Obama's plan to cut the nation's deficit is already being attacked by Republicans. The plan is in line with Democratic values. Why should those who make more than a million dollars a year pay tax only at the rate of 15%, when so many of us who earn far less are taxed at 35%? The Bush tax cuts should have been repealed a long time ago. The plan doesn't touch Social Security, and there is no proposed increase in the Medicare eligibility age -- a cost-saving plan the president was willing to agree to earlier in the year, to the dismay of liberals. The plan includes no changes in Social Security and does not include an increase in the Medicare eligibility age, which the president had considered this summer. 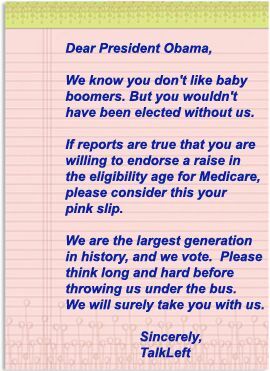 If it's accurate, I'm withdrawing my pink slip to President Obama. I'll even thank him. Update: Obama Deficit Plan Aimed at Democratic Base. From the New York Times: Business owners say Obama's jobs plan won't cause them to hire new workers. Here's President Obama just after he was elected in 2009, promising "reform" of both Medicare and Social Security. President-elect Barack Obama pledged yesterday to shape a new Social Security and Medicare "bargain" with the American people, saying that the nation's long-term economic recovery cannot be attained unless the government finally gets control over its most costly entitlement programs. ..."What we have done is kicked this can down the road. We are now at the end of the road and are not in a position to kick it any further," he said. "We have to signal seriousness in this by making sure some of the hard decisions are made under my watch, not someone else's." .... "Social Security, we can solve," he said, waving his left hand. "The big problem is Medicare, which is unsustainable. . . . We can't solve Medicare in isolation from the broader problems of the health-care system." I'm finally learning the meaning of hope and change. Three years ago, hope and change seemed like a slogan to roll your eyes at. No more. Now it's becoming something to strive for. But it's not the hope and change Obama can bring us, he's already failed that test. It's the hope for change we have at the thought of him leaving and taking his ineffective administration with him. Onto last night's speech. Obama is so transparent. His speech was all about construction workers, teachers, and veterans, and instilling fear of China and South Korea, because they are out to take our jobs. He went for the "heartland." As if all he has to do is proclaim South Koreans should be driving Fords and it will be so. The SuperCommittee Henchmen meet today. Raising medicare eligibility to age 67 is on the table for discussions. The Democrats have submitted a memo with various proposed changes and a discussion of each. Here's the memo. Raising the eligibility age appears on page 7. President Obama proposed raising the Medicare eligibility age as part of the debt-ceiling agreement, but Democrats are hardly united behind the policy. The ink isn't even dry yet on the horrid compromise budget bill which was supposed to shield Medicare beneficiaries, but already there's renewed talk of raising the eligibility age for Medicare, which now likely will happen since Obama has already said it's okay with him. It will probably be one of the first things the gang of 12 congressional henchman will agree on. I don't care whether the debt ceiling lift is temporary or permanent. 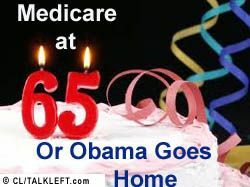 I care that I have paid into a system my entire adult life knowing I would get Medicare at 65 and social security at 66. Republicans want to steal the money I've already paid in and put it somewhere else, making me wait another two years for Medicare. And raise my taxes at the same time. If President Obama backs raising the age of medicare, which won't save the Government money in the long run due to the huge numbers of 65 and 66 year olds who will shift to Medicaid and who will break the backs of small businesses providing health care to elderly workers -- and which will force middle class elderly workers who don't have employer paid health care to pay premiums of ten thousand dollars a year or more for two more years, with huge deductibles and out of pocket costs, he doesn't deserve a second term as Democratic President. Let him run as as Republican or go home to Chicago. He will have sold us out. Given that Monday is Labor Day, I thought I'd take a look at my last Social Security/Medicare statment to see how much I've paid in taxes for both over my working life. The statement says I began paying into to Social Secuirty in 1965 (a part time job during high school) and continued up through the present. Given what I've paid in, and that I won't retire until 65 at the earliest, there's no way I'll get all that money back -- I won't live that long.I wonder how many people, like me, won't get their money back, either because they die, or they end up with reduced benfits due to the meme the Government is pushing that in 2014, SS will begin paying out more than it takes in, and by 2041 will not have enough to cover everyone? Why doesn't the excess paid in go back to our heirs if we die early? I've also paid a bundle into Medicare, which I'm years away from collecting on. If I die, Medicare too keeps the money it collected from me. Do they use it to pay medical care for someone else? A new report on Social Security and Medicare says they will begin paying out more than they take in in taxes sooner than expected. Social Security could be depleted by 2037. Social Security could be brought into actuarial balance over the next 75 years with changes equivalent to an immediate 1.6 percent increase in the payroll tax (from a rate of 12.4 percent to 14.4 percent) or an immediate reduction in benefits of 13 percent or some combination of the two. Ensuring that the system remains solvent on a sustainable basis beyond the next 75 years would require larger changes because increasing longevity will result in people receiving benefits for ever longer periods of retirement. At least the Senate did one thing right today. It passed the bill to restore Medicare funding that the House passed in June. And, it's veto-proof. The vote was 69-30 -- "a veto-proof margin," said Paul Precht, spokesman for the nonprofit Medicare Rights Center. Pres. Bush had threatened to veto the bill if passed. The cuts went into effect July 1. They included an $1,800 cap on outpatient physical, occupational and speech therapy. I know about this because this weekend I got a letter from the TL mom's nursing home saying that her therapy would end July 1 unless she agrees to pay 100% of the cost due to the Senate not getting its act together before the recess to pass the House bill that would extend the deadline for the cuts to take effect. It failed to pass the bill then by one vote. The cuts were passed in 2005 but every year Congress has voted to extend the date the cuts take effect.